Villa Sophia is a brand new, luxury detached villa right in the centre of Yalikavak. 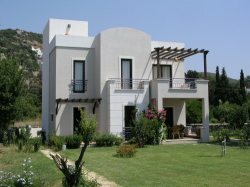 It is set in landscaped gardens and shares a large swimming pool and separate children's pool with the other villas on this small complex. The villa sits at the edge of the development and has beautiful views of the surrounding hills and mandarin groves from its large roof top terrace and first floor balcony. It is set back a little from the pool, providing privacy for dining on the lovely terrace. It is west facing and so gets the evening sun. Super for an evening drink on the balcony. The villa is in a flat area of the village making it ideal for push chairs and the less abled. 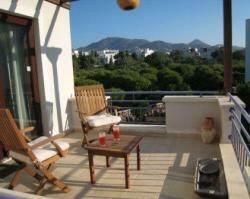 It is less than 10 minutes stroll along the flat to the sandy beach and village centre. Here you will find a beautiful old, unspoilt harbour with a variety of shops and restaurants. Downstairs there is a large open plan living space providing a well equipped kitchen area, dining area with large dining table and chairs as well as sitting room. There is a large ground floor terrace leading out from the sitting room which provides a lovely outdoor eating area. There is a further terrace leading from the kitchen where there is a barbecue. The ground floor also features a spacious cloakroom and toilet. On the first floor the master (double) bedroom has an ensuite shower room and its own private balcony. Relaxing chairs and a table are provided making it a lovely place to finish the day.The second bedroom provides twin accommodation. The third bedroom has a set of full size bunkbeds. The main family bathroom provides a bath with overhead power shower. The stairs lead up further to the spacious roof top terrace with spectacular panoramic views. This is furnished with large cushions and a low table in the "Turkish Corner" style. 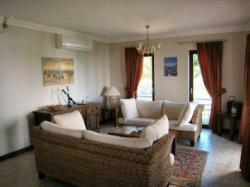 The villa is beautifully finished to a very high standard and has been equipped and furnished as our own holiday home. Yalikavak is a traditional Turkisk fishing village on the northern (quieter and less commercialised) coast of the Bodrum Peninsula. It has yet to appear in the mainstream travel brochures and so is a perfect retreat for those more discerning of travellers, looking for a quieter holiday but in easy reach of the hustle and bustle of Bodrum. It is well served by the local bus service with routes to all the resorts on the peninsula.There is no need for car hire unless you want to explore further afield. Although Yalikavak has it's own sandy beaches you might want to explore some of the others nearby. There are so many that you hardly need visit the same one twice. Yalikavak itself has some wonderful restaurants, naturally specialising in local seafood. There are many other restaurants easily accessible around the coast. There are also many bars in Yalikavak, but for more active night life visit some of the nearby neighbouring resorts.There are regular boat trips and buses for those wishing to explore further afield. The Bodrum Peninsula is one of the most beautiful parts of Turkey's Aegean Coast. There are numerous small fishing villages and resorts around the coast, each with their own individual character.There are many beaches to choose from both with and without watersports, to suit all tastes. There are boat trips to be had from many of these harbours.Both Bodrum and Yalikavak have marinas. For those wishing to partake in a little more serious yachting, yacht charter is available. Those wishing to venture a bit further might like to take the ferry across from Bodrum to the Greek island of Kos. There are many land based places to visit. These include Ephesus, the largest archaeological site in the world, the stunning pools at Pamukkale, the royal rock tombs at Dalyan, the temple of Apollo at Didim or St. Peter's Castle, built by the crusaders, in Bodrum itself.